Hello ALDLAND listeners, its the ALDLAND Podcast team, and we have quite the episode for you this week. Lip service is paid to the end of the Olympics and Canada is blamed for things that are assuredly their fault. If that’s not enough, your two favorite co-hosts get deep into discussing the NCAA tournament bubble. The first BCS rankings still aren’t out, and Google doesn’t know when that’ll happen, which means that we’re still in the wild frontier of polling. Every poll is equally legitimate right now, including this one, which is the only one that will accept your vote without making you buy nonnegotiable class B stock in KIA. Cast your burden-free vote below. As reported everywhere yesterday, Bret Bielema is leaving his head coaching position at Wisconsin to become the head coach at Arkansas. 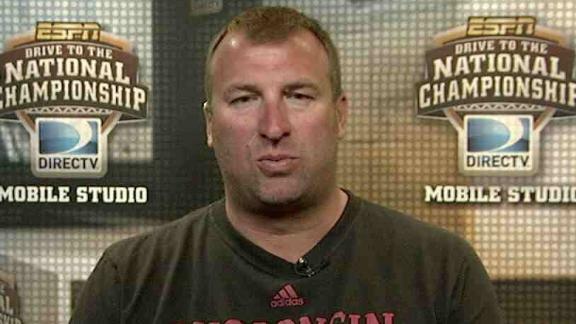 Bielema’s in his seventh year at Wisconsin, and he took the Badgers to a bowl game every year. When Wisconsin appears in the Rose Bowl this January, it will be the school’s third consecutive trip to Pasadena. Ten or fifteen years ago, a record and trajectory like this would cement the forty-two year-old Bielema’s (68-24 career record) destiny to become a legendary coach at Wisconsin and a top-echelon coach in college football’s historic conference. Today, it makes him plan B for a 4-8 team that went 2-6 in conference and itself lacks a consistent historical conference and regional identity. As much as Bielema’s decampment to Fayettville reflects the diminished stature of the Big Ten and affirms the completed rise of the SEC (and it’s hard to imagine the former’s recent expansion to fourteen teams didn’t play a role here), one has to wonder whether the Big Ten’s realization that the SEC is college football’s premiere conference actually indicates that we’re at some point on the downside of Peak SEC. Whatever Bielema’s decision indicates about the state of college football, one thing seems clear: any complaints from the new Hog coach about recruiting tactics are going to fall on deaf ears in SEC land. While I was in Chicago, I got into a discussion with a reader about whether high school was too early to read Vonnegut. While the results of that conversation were inconclusive, this post is unequivocally too late. So it goes. Week three of college football and week two of the NFL definitely stand as prime territory for some on-field slaughters, and this past weekend did not disappoint in that regard. First, Vandy took the Presbyterian Blue Hose to the woodshed in Nashville, where the Commodores claimed their first win of the season by a 58-0 mark behind new starter Austyn Carta-Samuels. It was the Vanderbilt running game, nonexistent last week against Northwestern, that shone this Saturday, when Zac Stacy took the first Vanderbilt play from scrimmage 86 yards to the house and never slowed down. There was no shortage of lopsided scores around the country Saturday, including Clemson’s 41-7 takedown of in-state team Furman, the expected Arkansas defeat at the hands of Alabama, 52-0, and other top five blowouts, including LSU’s (63-14 over Idaho), Oregon’s (same score, over Tennessee Tech), and Florida State’s (52-0 over Wake Forest). Not all of said slaughters were so favorable for teams this space likes to track, particularly including Notre Dame’s 20-3 takedown of Michigan State in East Lansing, for which there is no excuse. I’m glad I couldn’t watch it. The NFL wasn’t especially compelling this weekend, even though a number of games on Sunday afternoon came down to the wire, technically speaking. The main NFL topic this week is likely to be the Monday night game, which has already seen its share of storylines, including multiple Peyton Manning interceptions early and an apparent lack of control by the scab referees. To round out the slaughter theme, of course, we go to the Motor City, where the Tigers continue to lose, first on a blown save by Jose Valverde against the mighty Cleveland Indians, and then in a make-up game this afternoon against the inexplicably division-leading White Sox. Football is underway at all levels, which means that this weekly roundup/preview post is back. College football’s second week portended less excitement than its opening week, and yet there seemed to be more surprising results this week than last. In particular, two teams with a lot of preseason promise took big hits on Saturday. The Wisconsin Badgers fell out of the Top 25 and fired their offensive line coach after a loss to Oregon State in which the traditional running power generated only thirty-five yards on the ground. Arkansas’ drop from the rankings was even more precipitous, as the Razorbacks lost to Louisiana-Monroe. Michigan, fresh off a no-show against Alabama, nearly lost their home-opener to Air Force, while Clemson nearly doubled up Ball State to stay undefeated, a status they’re likely to carry into their meeting with #5 Florida State in two weeks after facing in-state lightweight Furman this weekend. Michigan State also stayed undefeated with an easy win over Central Michigan, while Vanderbilt fell to 0-2 at Northwestern in a game I attended and more about which I will writehave written. Robert Griffin III was the star of the NFL’s first Sunday of 2012, while Andrew Luck found himself grouped with more pedestrian rookie QB starters Brandon Weeden and Ryan Tannehill. The always-overhyped Jets turned in the surprise team performance of the day, a 48-28 win over Buffalo. The Lions, who have an official drum line, came from behind to beat the Rams in the last ten seconds of the game, and Peyton Manning returned to form in an ultimately convincing win over Pittsburgh. Outside of the football world, Serena Williams gutted out a win at the U.S. Open, her fifteenth Grand Slam title, and Jeff Gordon announced that his “absurdly comical mustache” for the NASCAR Chase (i.e., playoffs), which begins this weekend in Chicago. * I usually excerpt an enticing portion of these longer pieces to get readers to click through and read them. In this case, though, there wasn’t any brief quotation that would serve those purposes, so I’m leaving it to the title and that photograph. The article is more of a (very) short story with two merging temporal threads told in the author’s own, somewhat distant, voice. A good way to pass your lunch break, for example. ESPN’s College Gameday returns to Nashville this Saturday, with the focus on an 8:00 pm Central game between Vanderbilt and top-ranked Kentucky, following a 6:00 Eastern game between Michigan State and Ohio State in Columbus. It’s a big night for college basketball– particularly ALDLAND’s brand of college basketball– and because I’ve been to Columbus once and have no immediate desire to return, we’re taking you live to Memorial Gym for the late game. Both Kentucky and Vanderbilt had high expectations before the season started, ranked #2 and #7, respectively, and while the Wildcats currently are surpassing those expectations, the Commodores have faltered. There are two main donkeys on which the tails of their struggles can be pinned: 1) knee injuries to big-man Festus Ezeli, and 2) a lack of bench support. These two rationales also provide good (and mostly legitimate) smokescreens for what Vandy fans fear may be behind their team’s difficulties: the apparent mental weakness that has kept this group from rising to its physical potential in past years. One sign that this spectre is fading is the pleasantly aggressive and frequently commanding performance of Jeffrey Taylor. Before handing this post over to more accomplished previewers, a note on one similarity and one difference between these two teams. First, many have cited the Wildcats’ size as a factor in their success this season, but Vanderbilt actually matches up well with them physically. Second, Kentucky’s coach, John Calipari, is known for favoring young players, and this year’s starters– three freshman and two sophomores– track to that preference. Vanderbilt, meanwhile, starts a veteran crew: four seniors and one junior. For an extended, thorough analysis of Saturday night’s game, read this preview at Open ‘Dores. For a Vandy pep talk, watch Jay Bilas’ video hit. I’ve seen these two teams play twice before with mixed results. In 2008, the Commodores avenged a 79-73 double-overtime loss in Lexington by stunning the Wildcats 93-52 at Memorial Gym. I stunned myself with my own foolishness when I realized, after the game, that I’d locked my keys in my car and that, even in the Mid South, February is a cold month. Two years later, I saw these two again, when Vandy dropped a heartbreaker at home in 2010, losing by two points after missing multiple opportunites to seal a win or send the game into overtime. That was the most exciting game I’ve attended where the team I favored did not win. 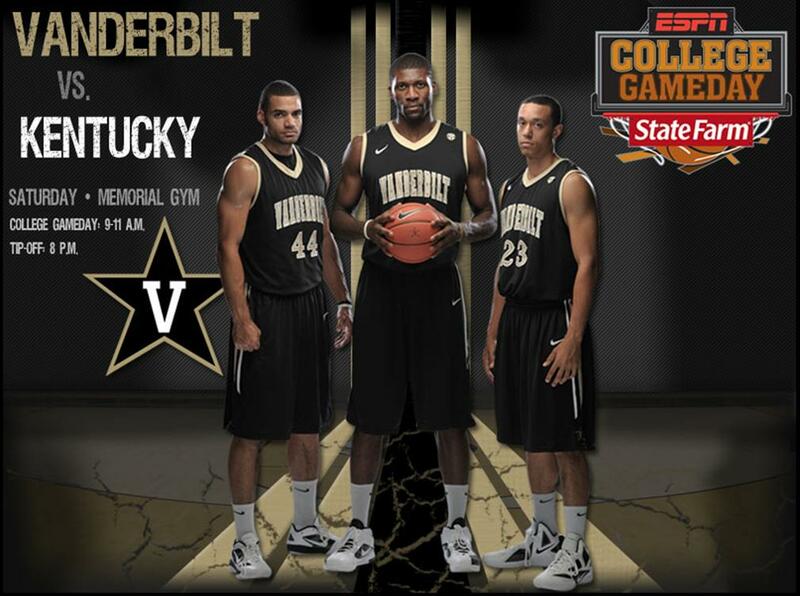 Tomorrow’s game presents an even tougher test for Vanderbilt. I know Bilas is a Dookie of the first order, but if he says they can win, then it can be done. Plus, Vanderbilt has recent experience knocking of #1-ranked rival teams: they did it it to Tennessee in 2008.